How do I Teach my Infant Sign Language? 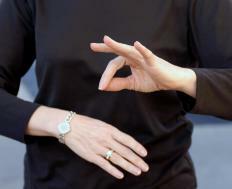 Parents should start teaching their infants sign language at six to nine months of age. Although infants have the capacity to understand language very soon after birth, they lack the physical and mental development necessary to communicate verbally until later. Baby sign language takes advantage of the fact that an infant’s manual dexterity functions well before his or her articulators, which are the mouth, tongue and lips. While an infant cannot articulate a word he wishes to communicate, he can show his parent what he wants by using sign language. This spares parents and babies the frustration and stress of babies crying and whining over simple needs. Some critics of baby sign language believe that signing delays verbal communication because a child who signs does not need to speak. On the contrary, studies have shown that teaching your child sign language encourages her to be an active communicator. Speech pathologists have long encouraged parents to help their children by teaching them how to communicate. A study conducted by the University of California at Davis showed that children in second grade who had learned sign language as infants had dramatically higher IQs than their peers who had not learned sign language. Children who learn early how to effectively communicate using sign language carry that confidence into the next phase of development, which includes learning verbal language. This confidence encourages them to be active participants in a conversation. Many parents are daunted at the idea of teaching their child sign language, while in reality, it is not as complicated as one may think. There are many resources available to parents who want to teach their children sign language. Online, there are various sites that have video instruction and demonstration of sign language words, step by step. These are typically organized in a dictionary format, making it simple to look up words a parent wishes to teach his child. At the library or bookstore, there are several books available to help one teach her child to sign. Parents can also purchase videos, flashcards and puppets to help facilitate the instruction. Classes are a more interactive approach and may be easier for parents who are intimidated by teaching their child themselves. Infant sign language is based on American Sign Language (ASL), so for those who speak English, it is easy to find plenty of resources to learn and teach the language. It is smart to start teaching your infant at about six to nine months. One may begin earlier, to make it a habit for both the parent and the child, but more than likely, the child will not be able to sign back before then. Sign as much as possible, interjecting signs into conversations with the child. It is also smart to teach other family members so that they can use signs in conversation with the child as well. Once the child has mastered the first few words, add others gradually. Be patient, encouraging and positive. In the long run, perseverance will pay off for both parent and child. How Do I Choose the Best Sign Language Courses? I signed with all three of my babies and I can honestly say they all do exceptionally well at their spelling tests and academics. I found a great small signing dictionary that has words specifically for infants and young children like McDonalds, zoo, bear, etc. It is called "Teach Your Tot to Sign," by Stacy Thompson. shoeshopper- It depends on many factors. It will depend largely upon how much you taught your baby and how often you practiced it. If you only taught your baby a few signs, they will likely lose the knowledge once they begin to speak. If you taught your baby many signs, they will retain more information. Additionally, if you practiced signs with your baby over many months, they are more likely to retain the information. It will also depend upon if you continue to sign with your child once they learned to speak. Continuing to practice with your child will help them retain the knowledge better. Do babies who are taught sign language still retain the skills later in the life?